Vladimir Putin said the document was another step not only in improving mutual legal systems, but also in economic development between the two nations. Leonid Tibilov added the friendship between the two countries and the stepping up of integration processes, were an answer to threats and challenges existing in the modern world. 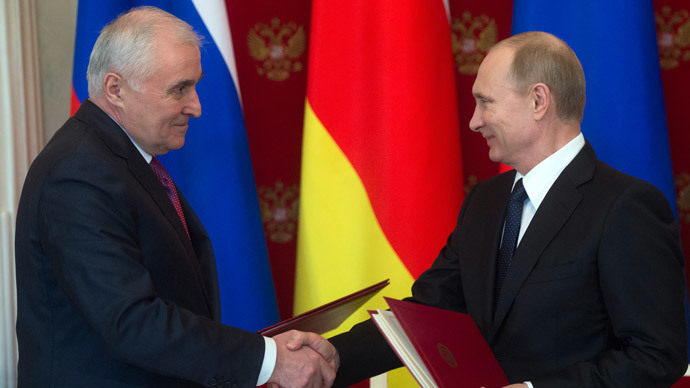 The document sets out that Russia would provide for the security and defense of South Ossetia, including constant protection of its state border. In return, South Ossetia would allow part of its military to join Russian military forces. The details of the process must be developed jointly by the two countries within six months of signing the treaty. The procedure will be financed by the Russians and 1 billion rubles (about $16 million) will be allocated from the Russian budget for this purpose. The treaty with South Ossetia is very similar to the agreement with the Caucasus republic of Abkhazia signed in 2014 and ratified by the Russian parliament in January this year. Both republics were recognized by Russia after a brief war in 2008, which took place after Georgia tried to reclaim South Ossetia by military force, in violation of ceasefire agreements and despite Russian peacekeepers’ presence.